There are certain cities that Aleheads speak of in hushed tones. Cities that have embraced craft beer culture and feature wonderful, local breweries, taprooms, beer festivals and more. These are the cities that Aleheads are proud to call home. Cities where groups of Aleheads make their pilgrimages to wallow in the craft beer revolution and imbibe a few too many tasty brews. San Diego, San Francisco, Boston, Denver, Chicago, Asheville, Seattle, Philly…these cities all have so much to offer a true Alehead. But even the most rabid homer knows that one city towers above all others when it comes to craft beer. One city has made craft beer such an integral part of its culture that it has added “Beervana” as one of its many official nicknames. That city? Portland, Oregon. There are over 60 breweries in the Portland metro area (and well over 100 in the state). Oregon is the 2nd largest producer of craft beer in the US (behind only far-more-populous California). Around every corner, in every neighborhood, there’s a brewpub. Seemingly every restaurant, bakery, and coffee shop in Portland offers at least one or two local craft options on tap. Wherever you turn, wherever you go, craft beer abounds. It’s heaven for Aleheads. I was recently tapped to attend a conference in Portland and, of course, leaped at the chance. Fellow Alehead and old friend Beerford had just settled into town and Wifey and the kids had never been to the Rose City (to be fair, our youngest is 4 months old…she hasn’t been to very many places). So we decided to turn my work trip into a family vacation. And while family vacations aren’t the ideal scenarios for beer exploration, long-suffering Wifey gave me ample opportunity to take in the beer sites…just so long as I wasn’t too hungover to wake up with the little ones in the morning (she’s tough, but fair). 1. Deschutes: To no one’s surprise, Deschutes was the first place we stopped after landing in Portland. It was just two blocks from where we were staying in the Pearl District (and very close to a Whole Foods with a very respectable walk-in beer fridge…I stocked up there almost daily). 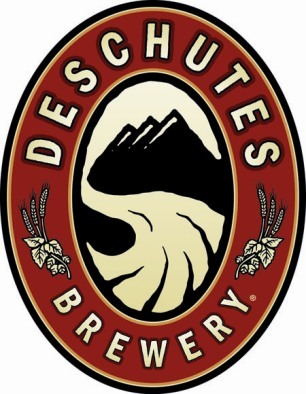 The Portland brewpub pales in comparison to the Bend flagship, but when the beer is from Deschutes, who really cares? The food is good, the service is better than average*, and the Hop in the Dark, Black Butte and Obsidian Stout are flowing freely. What more could you want? *Here’s where I’ll make my one, obligatory, negative comment about Portland…the service industry is horrific there. It’s not that the waiters or cashiers are rude or surly…they just clearly don’t care. The problem, which becomes obvious the longer you’re in the city, is that the majority of service industry jobs are held by hipsters. I have nothing against hipsters (other than their inexplicable love for PBR), but they make terrible waiters and waitresses. You see, hipsters are stuck in that tricky liminal mindset where they believe that true 9-to-5 (or beyond) jobs are “selling out” while service industry jobs are beneath them. They have no desire to put on a tie or cover up their tattoos, so they’re forced to work registers and wait tables. But they hold those kinds of jobs in contempt and their lack of interest in performing them well just oozes from every pierced orifice. This is actually a pretty major problem with most members of my generation…we’ve been raised to believe service industry jobs are beneath our pricey college educations so when we’re left with no other option, we take those jobs and perform our work in the most desultory way imaginable. End rant. We actually went back to Deschutes a second time with Beerford and the Captain and sampled some cool one-offs like the Mos Eisley (a wonderful sour, balanced with candy apple-like sweetness) and Chainbreaker White IPA. The brewpub feels a little “touristy”, but hey, we were tourists…and the beer was delicious. It’s probably not a true haunt for locals, but I would highly recommend it for folks like me who are just in town for a few days. For me, at least, Deschutes can do no wrong. 2. Bailey’s Taproom: This was probably my favorite stop in Portland. It’s essentially the perfect beer bar. It happened to be about halfway between where we were staying and where my conference took place so when I walked by it one morning on my way to work, I took a peek inside, decided I should stop by after my day wrapped up, and kept that promise. What makes Bailey’s so ideal? A. 20 Taps: This just seems like the right amount of handles for a small beer bar. Less than that and there’s not enough variety…but much more and you’re worrying about dirty tap lines or you start to have three or four very similar offerings available. But 20? That’s just right. They also have a cask once a week and a beer engine which is occasionally used for firkins. B. No food: OK, this could actually be seen as a drawback, but I like a bar that focuses exclusively on the beer. It allows the staff to specialize in the suds and you don’t have to worry about being treated as a second-class citizen if you’re not eating as well (a pet peeve of all Aleheads). If you’re starving, the taqueria next door will deliver food to your bar stool. C. One-offs and Rarities: The Bailey’s tap-list is a wonder. Everything is local (from Oregon, Washington or California) and everything is at least somewhat rare. They try not to have more than one offering from any particular brewery (the most I saw was two from one place) and they never have the most obvious beers. I didn’t see Upright’s fairly common Saison series on tap (the Four, Five, etc. ), but they did have their Monk and Mingus, a delicious Belgian Coffee Stout. And Bend Brewing’s easy-to-find Outback X was MIA, but their Ching Ching (a hibiscus-infused, tart Berliner Weiss) was available. If you’re looking to try something different, Bailey’s will have it. And if the tap-list doesn’t tempt you (which it will, I promise), they’ve got a great bottle selection as well. D. Taplist TV: Bailey’s absolutely nails their taplist presentation. It’s located on a huge, flat-screen TV right behind the bar. It lists all the beers, their styles, their ABVs, who brews them, AND how much beer is left in each keg (with a little graphic showing green for full, yellow for half or less, and red for nearly empty…it even has a little “Just Tapped” logo for the freshest brews). 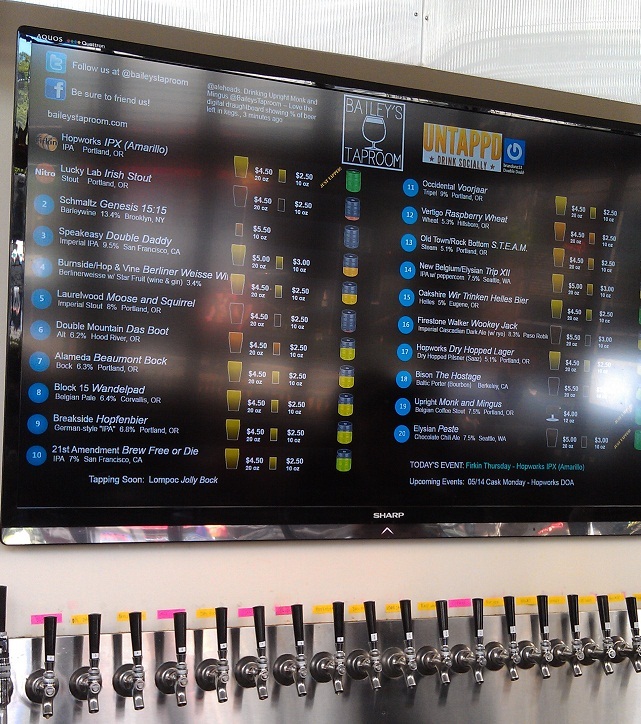 The TV also shows which kegs are coming on next and which to look for in the future. It even has a little Twitter feed up top (which I had fun with while drinking). Loved this feature. E. Reasonable Prices: $4.50 for a 20-ouncer, $2.50 for a 10, and $7.50 for five, 5-ounce tasters. Considering the quality of the suds, you can’t beat those prices with a stick. F. Knowledgeable Staff: The guys behind the bar knew their stuff and were clearly passionate about beer. They had tried everything on the menu, made some great recommendations, and weren’t stingy with the sample glasses. G. Intimate Size: I like a nice, cozy bar and Bailey’s was compact and comfortable. This was no cavernous beer hall or sprawling brewpub. Just a cool, local hangout with funky, beer-related decor and no nonsense. Thanks to the reasonable flights, the Captain and I were able to try every beer on tap and still have room left for a couple great bottles. On my next jaunt to Portland, Bailey’s will be my first stop. 3. 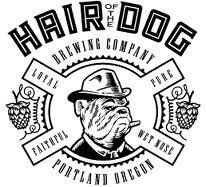 Hair of the Dog: This Portland stalwart has been an Aleheads’ fave for nearly two decades. During my years in DC, a few of the Hair of the Dog beers were readily available at the Brickskeller and I fell in love with their high-octane brews. The brewery taproom is fairly spartan. A small, but solid-looking menu (we didn’t eat there, so I can’t vouch for it) and a half-dozen or so HotD offerings on tap. This is clearly a production facility first and a taproom second, but that doesn’t take away from how tasty their products are. The Captain, Beerford and I were able to sample some Greg (a winter-squash brew), Ruth (a light-bodied, well-hopped pale ale), Blue Dot (a great, uber-bitter DIPA), Doggie Claws (their big barleywine) and a wood-aged Adam (a dark, strong ale that was absolutely amazing). Hair of the Dog really is a spot-on brewery. Just be careful…a number of their offerings top 10% ABV. My mouth is puckering just thinking about it. 4. Cascade Brewing: This was #1 on my list of “must-visit” stops and it did not disappoint. In fact, it completely exceeded expectations. The taproom had a nice, neighborhood feel with a great bar and an open-air seating area. We grabbed a table and picked up some flights. Cascade had two tasty barrel-aged brews available and 16 other draft offerings. Those offerings were divided in half (kind of like Russian River) with 8 “standard” beers (like an IPA, Stout, etc.) and 8 sours (the beers for which Cascade is rightly famous). I sampled their Vintage Beckberry, Sang Noir, Nightfall, Saison Minuit and their glorious, incredible Kriek (probably their flagship and one of the tastiest beers on Earth). If you love sour beers as much as I do, you owe yourself a trip to Cascade. They’re on par with Russian River for making tart, complex, drinkable sours. 5. Green Dragon Tavern: Things were getting a little fuzzy when the boys hit up the Green Dragon (just a stone’s throw from Cascade). This renowned, slightly divey beer bar has over 60 taps with lots of eclectic stuff available. I tried the Elysian Peste (a fiery chocolate-chili beer) and Ninkasi Believer (a rock-solid Imperial Red). The Green Dragon is fairly sprawling and has plenty of character and just a touch of dank. It was surprisingly empty for a Friday night, but maybe the locals just knew a bunch of drunk, jackass Aleheads were in town so they split for the weekend. 6. Belmont Station: The king of the Portland bottle shops, Belmont Station has by far the best selection in town. Located in a quiet, residential neighborhood, the unassuming facade opens to reveal all manner of delectable brews inside (including the only bottles of Pliny the Elder I saw in Portland). Beerford chauffeured me to Belmont Station so I could stock up on some local treats that he graciously offered to ship back to me. I spent entirely too much money, but the prices were quite reasonable and the managers were very helpful. Belmont Station also houses a great little biercafe with a mouth-watering taplist. I was able to sample some Ninkasi Babylon (an “English-style” Double IPA…very interesting) and a cask-conditioned Double Mountain Imperial Red Ale (also excellent…which seems to be a running theme for the beers I tried in Portland). 8. Hopworks: After hitting up Belmont and the Horse Brass, Beerford and I trekked over to Hopworks. I was worried we wouldn’t have time to get to this gem, but since it was on the way back to the Pearl from the Horse Brass, it was an easy place to stop. 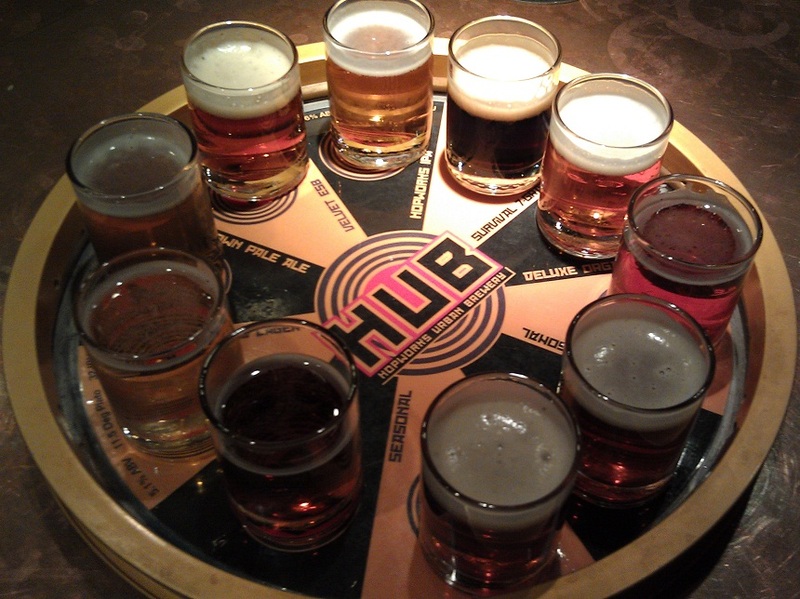 We ordered up a flight of 10 brews which come served in a circular tray that looks like a dart board. It’s actually supposed to resemble spokes since the leitmotif at Hopworks is bicycles and wheels. Our flight came with the HUB Lager, Crosstown Pale Ale, IPA, Velvet ESB, Single Hop IPA (with Amarillo), Survival Stout, Galactic, Deluxe Organic Ale, Canadian Tuxedo (a Belgian Dark Ale) and Rise Up Red. The Galactic and Stout were the winners for me, though the IPA and ESB were outstanding as well. I was also able to snag a bomber of Secession CDA before we left. There were so many more beer highlights from the trip as well. I enjoyed offerings from Lompoc, Heater Allen, Bridgeport (we stopped by their brewpub on our last night there), Alameda, Coalition, Laurelwood, Lucky Lab, Migration, Upright and on and on. 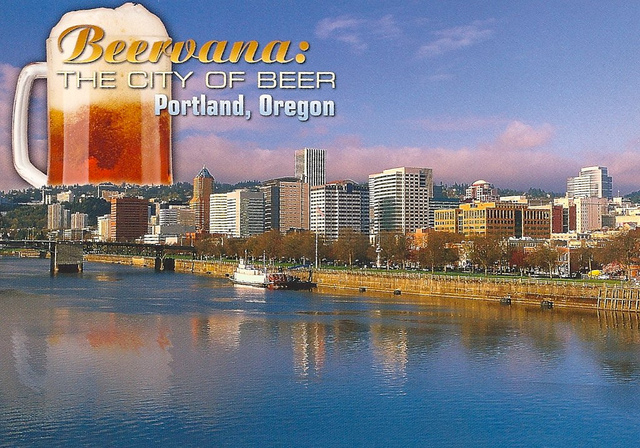 The beer never stops flowing in Portland…and an Alehead in Beervana never stops smiling. Posted in Beer Culture, Travelogues.Tagged Bailey's Taproom, Beervana, Belmont Station, cascade, Deschutes, Green Dragon Tavern, Hair of the Dog, Hopworks, Horse Brass Pub, Oregon, Portland. I normally love your posts but it is a crime that you called the Horse Brass Pub the Brass Horse. Don Younger would be rolling in his grave. That being said, I hope you enjoyed your trip to Portland, I got here 5 years ago and am never leaving. Cheers. Though you have to admit, the Brass Horse Pub at least “sounds” more normal. Who has even heard of a horse brass these days? I think Don Younger went out of his way to make the name unique for that reason. It would have been great if you could have met him during your trip here. Bailey’s Taproom was by far my favorite spot when the girlfriend and I visited last Halloween. Glad to see it make your list. And since it was Halloween, as we were sitting there, a full-on, lights flashing Ecto-1 drove by. Halloween in Portland. Fantastic. Any word on the Sasquatch Brewery yet? It wasn’t open when we were out there, but it’s on the list of places to visit when we go back. I second that, Bailey’s is a spectacular sopt, as is Green Dragon! Keep on coming back, most of us Portlanders aren’t hipster doofuses. Of course not. While you may have more hipsters per capita than anywhere outside of Williamsburg, they’re clearly still in the minority. Loved your city. Can’t wait to head back. Got there last summer. It truly is an amazing beer city, and none of the bottles I brought back in my luggage leaked. Can I assume that you weren’t able to hit the Upright Brewery/Tasting Room? It kind of keeps odd hours (believe weekends only and two hours before Trailblazers games), but it’s an incredibly cool place to get a flight. Maybe five picnic tables, a small fridge, turntable playing 70’s funk, and taps in the wall……all basically in the basement of an unmarked office building. It felt like getting a drink in Walter White’s meth lab, especially b/c you’re right next door to the kettles. Anywhere playing 70’s funk is alright by me. The much-heralded BeerCast US roadtrip (still potentially taking place in 2013) has just been amended to begin and end in Portland. Of course, I already knew how amazing it was for beer – the city has the same number of breweries as the entire country I live in! Bailey’s Tap House looks astonishing. And a ten-beer flight? God bless America. I just got back to the Midwest from a massive West Coast road trip that started in Seattle. Portland was definitely the standout (just edging out the Denver/Boulder/Fort Collins area). Picked up some Collage from Deschutes. Hit up HotD where I was able to try a 2008 Fred from the Wood on tap, which was outstanding. The fact that you cannot carry out any of their vintage bottles is pretty awesome but frustrating as well. I don’t know if you left it out or if you just didn’t go (which is somewhat hard to believe) but Apex was the highlight of Portland for me. I was there during their 2nd Anniversary celebration, and the list of 50 beers they had on tap was mind blowing, along with an outrageous bottle list. Tons of vintage Portland area offerings (HotD, Cascade, Deschutes), as well as many one-offs from the big-hitters in California (RR, FW, SN), not to mention Cantillon, Waldo’s Special, and numerous others. I walked out with a ’09 Sang Royal and a 2011 Cherry Adam. Yeah. Portland = greatest beer city in the US. Why is “Canadian Tuxedo” a Belgian dark ale, anyway? While the vast majority of your post resonates with me, particularly in the choice of venues you write about, I do take issue with your sweeping criticism of service in Portland. While I concede that I have experienced the measured aloofness and studied indifference to the customer that you refer to in some places, in general we have both extremely friendly and well-informed service most of the time. We only visit twice per year, but in our favorite haunts are treated like locals. I cannot say the same for much of Chicago for example. That aside, I can agree with your assessments of the places you discuss, in particular, Baileys, Cascade Barrel House and HOTD. I would avoid Green Dragon in future however. Although it has a wide selection, it is owned by Rogue, and employs weird sorts of marketing gimmicks like giving you a “passport” for getting points and something about wearing Hawaiian shirts (wtf). Replace Green Dragon by Apex next time (okay it’s a hipster haven) for a really wide selection, wide outdoor seating and access to really good Mexican food next door. I definitely agree with your assesment of the service industry in Portland. If you don’t have tattoo’d arms and multiple piercings and a general malaise it seems that you are not qualified to work in one of our many fine beer centric establishments. That being said I disagree about The Green Dragon. While it is owned by Rogue I frequent GD at elast once a month and have had nothing but pleasant experiences there, especially when it hosted the AHA Rally last year. 50 rotating taps featuring well known breweries lesser known beers is fine by me. Also, during the summer the patio is a great place to hang with friends. I tend to enjoy the smaller more “locals friendly” spots in our fine city (Amnesia, Migration, Burnside, New Old Lompoc, etc.) but really in a town as beer crazy as Portland how can you go wrong.